The initially serene footage begins with a close up of a beaten up radio playing La Mer (you probably know it from Bioshock). Under a blue sky, two men are fishing. One gets a bite, but it proves to be more than he can handle. The line furiously unspools until the small boat is dragged uncontrollably across the surface. Before the rickety ship can be pulled under, the man let's go of the line and looks down. Just under the surface of the deep blue ocean is a stingray, only this stingray appears to be mechanical and has a row of blue lights around its edge. As the camera cuts back to the men on the boat, a shark fin emerges from the water, but this too is no ordinary shark. It's one of a fleet of sub-aquatic ships. As the camera plummets underwater we see the extent of this vast armada with vessels of varying size, from single-person mechanical sharks(! ), to enormous battle ships that look large enough to transport armies. It's reminiscent of the Rebel fleet in Star Wars, but way wetter, and sets up this underwater world beautifully. At the end of the Justice League panel an audience member asks a perceptive question: does this army belong to the King of Atlantis, or his sworn enemy Black Manta? The answer: neither. "That's Ocean Master's army". 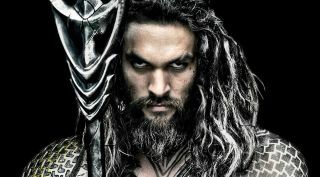 It seems Arthur Curry's villainous half brother will be a major threat in the movie. The footage ends with Aquaman in his civvies, standing in the dried out husk of a shipwreck that looks like it's been stuck on the bottom of the ocean for centuries. "You don’t want to talk about this, do you?” He asks an unseen face offscreen, before turning around and showing just how proficient he is at twirling a sword and striking a perfect hero pose. "Neither do I." Concept art also shown on screen gives us a feel for the world that James Wan is building, and it looks wildly ambitious. James Cameron is rumoured to be setting his Avatar sequels in an underwater kingdom. Judging by what I've seen, DC may have beaten him to the punch.